I’d like to introduce my readers to the online boutique, shop junCk. They have many beautiful handcrafted items including gorgeous jewelry. 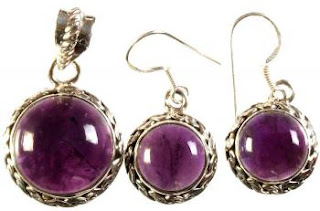 I love the Amethyst Pendant with Matching Earrings. I had the opportunity to interview PSZ of shop junCk. I hope you enjoy the interview and learning about this special store! shop junCk is an online boutique that sells unique products that are sourced from different rural and urban corners of the world. Our goal is to showcase the work of skilled artists and craftsmen that are primarily based in developing nations and have limited access to distribution channels in North America/Worldwide. Our aim is to expand the reach of their exquisite and quirky work to a larger market, thereby benefiting/supporting not only the artists, but also consumers who can now buy these products online at attractive prices. What kinds of products do you sell? Our products range from handicrafts, home accents, accessories to jewelry. Items currently featured include brass trumpets, miniature aluminum rickshaws and motorbikes, handmade embroidered bags, wooden tic tac toe games, couture jewelery, etc. Are they all products you make or are they made by other people? All products sold on shop junCk are carefully selected and are made by unestablished artists and craftsmen that are primarily located in developing nations. Our typical customer is someone who has an individualistic sense of style and enjoys handmade products created by independent artists and designers from around the globe. We also tend to attract any customer that enjoy strolling through flea markets and weekend fairs during their travels looking for small gifts and products that they wouldn’t typically find in their local mall or retail outlets. What are your future plans for shop junCk? shop junCk is first and foremost about encouraging and promoting creativity. Therefore our future plans would be to accept product submissions from everywhere (rural and urban areas/artists). We’d also like to provide customers with creative tools to help customize their experience. Why should customers buy from shop junCk? Buying from shop junCk helps support the talented, eccentric and sleep deprived artists who rely on their creativity to make a living and may unfortunately spend a lifetime without having their work ever make it to your local mall or corner store. We offer free shipping (worldwide) on all orders and a 5% discount for new customers! (use code: Cobiifriend while checking out via Google Checkout). Where can you be reached? Please check them out and see what they have to offer. I think its a great thing what they have started!